Just_Me_D, ThePinkChameleon, Sekelani Zwambila and 10 others like this. Here's mine from my favorite comic artist. RobbyRob, ThePinkChameleon, agarwal.apar and 5 others like this. ThePinkChameleon, MRSBROWN2006, jenmeow78 and 2 others like this. My lock screen is my photo. Just staking a claim! agarwal.apar, DarlaMack and Just_Me_D like this. Keep changing apps, it's not just an iPhone 6 iOS 8 thing, but really trying to use my phone more for managing my time, now that I am splitting locations. ThePinkChameleon, Lawns and johnathandgrant like this. ThePinkChameleon, jenmeow78, Lawns and 3 others like this. LadiJae, ThePinkChameleon, DarlaMack and 2 others like this. Craig, ThePinkChameleon, smoveal and 8 others like this. ThePinkChameleon, anon4757448, Edmilan and 1 others like this. LadiJae, ThePinkChameleon, Evilguppy and 2 others like this. ThePinkChameleon, Edmilan, kazp3r17 and 2 others like this. LadiJae, ThePinkChameleon, TheOneRico and 1 others like this. 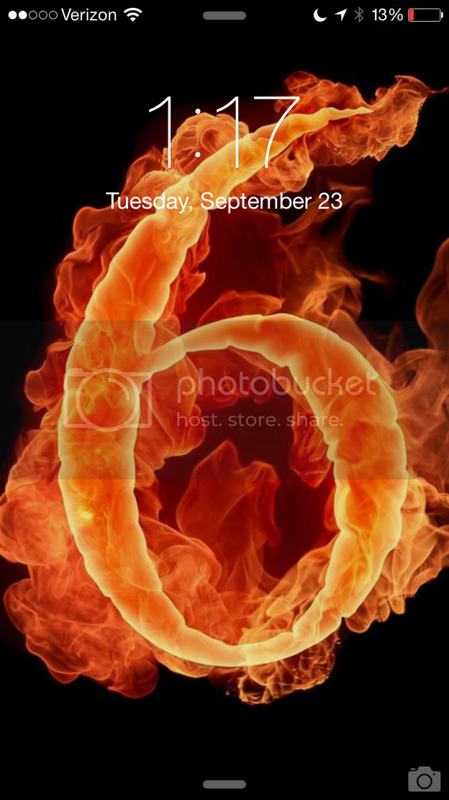 This may be a really dumb question but I am used to Android... How did you change the lockscreen clock to black? Runner85308, Spencerdl and wetermommy like this. ThePinkChameleon, Lawns and Spencerdl like this. No clue bro. lol. iPhone might do it automatically based on background? Not a dumb question. It's changes depending on the color of the wallpaper. I noticed friends changed Sent from iPhone To Sent from iPhone 6. Would you do that? How Do You Backup an iPhone 5s? Best apps to show off your new iPhone 6 and 6 Plus!